AnythingAuto.co.za is an information portal that provides you with instant access and links to various auto parts and accessory supplier’s information. Search and browse our Auto Parts Directory for new, used and replacement auto parts or motor spares. From spares shops, scrap yards, car service centres, tyre fitment centres, vehicle repairs or workshops and accessory suppliers for performance and look enhancements. 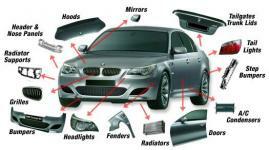 AnythingAuto.co.za is an all round marketing tool solely aimed at the South African motor industry. We aim to serve three very different but vital target markets in the South African motor industry. AnythingAuto.co.za works closely with all the major motor manufacturers represented in South Africa and provide a platform for all their sales staff to easily source and contact their approved suppliers. For the advertisers on the site we provide a cost effective portal for their customers (the users and motor manufacturers to easily gain immediate access to their contact information and a direct, visual link to their websites and product information. For more information on all our services please feel free to contact us directly.